After establishing an impressive reputation with the Kweskin Jug Band during the 1960s, Geoff and then-wife, Maria Muldaur recorded their first album, “Pottery Pie,” on Warner Bros. Records in 1969. It was on this album that Geoff recorded his celebrated version of “Brazil” (original title Aquarela do Brasil) which became the title inspiration and the opening theme for Terry Gilliam’s 1984 film “Brazil”. After recording “Pottery Pie,” the Muldaurs moved to the burgeoning folk, blues and folk-rock in Woodstock, New York. They separated in 1972, shortly after Geoff joined Paul Butterfield’s Better Days group. 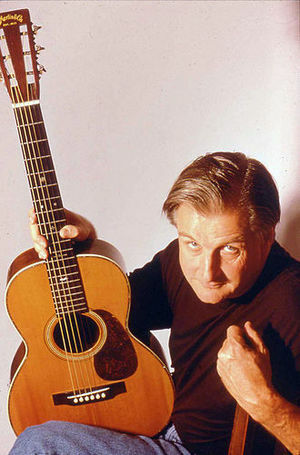 After leaving the Butterfield band in 1976, Geoff recorded two more solo albums for Warner Bros. Records, a duo album with guitar wizard Amos Garrett (of “Midnight at the Oasis” fame), a solo album on the Flying Fish Records label and a jump band album, “Geoff Muldaur and the Nite Lites” for Hannibal Records. During this period, Geoff also recorded with Bobby Charles, Jerry Garcia, Eric Von Schmidt, Bonnie Raitt, John Cale and others. In the early 1980s, Geoff left the stage and recording studio for a working sabbatical. During this period, he composed scores for film and television, winning an Emmy Award, and produced albums for Lenny Pickett and the Borneo Horns and the Richard Greene String Quartet.